Mr. Termite did find his way into this 12 year old town home… He sure built some nice Mud Tunnels. Subterranean termites need moisture to survive, so they rely on soil for the moisture they need. 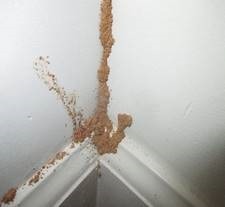 When termites travel above ground, they take the soil with them so they don’t dry out. The tubes may extend over concrete foundations and other exposed surfaces, and then they are easier to see.